This box shows the color amber. The color Amber is a yellowish-orange color. It got its name from the material known as amber. The amber color is halfway between yellow and orange on the color wheel. The first recorded use of amber as a color name in English was in 1500. Amber is used in traffic lights and turn signals. Amber is a symbolic color symbolizing energy. The color amber is associated with Zoroastrianism because of its practice of fire worship in fire temples (actually, the holy fire is simply a representation of the spiritual energy of God [ Ahura Mazda ] ). The original Amber Room in the Catherine Palace of Tsarskoye Selo near Saint Petersburg was a complete chamber decoration of amber panels backed with gold leaf and mirrors. Due to its singular beauty, it was sometimes dubbed the Eighth Wonder of the World. 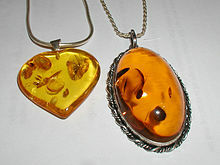 Amber is a colour worn by Hull City AFC, an English Association football team. Also worn by Mansfield Town F.C. This page was last changed on 16 February 2019, at 08:18.